The annual Chicago Pride Fest will take place in Boystown this weekend bringing plenty of fun under the sun with national acts, a pride pageant, pet pride parade, and music starts including Taylor Dayne and Thelma Houston. 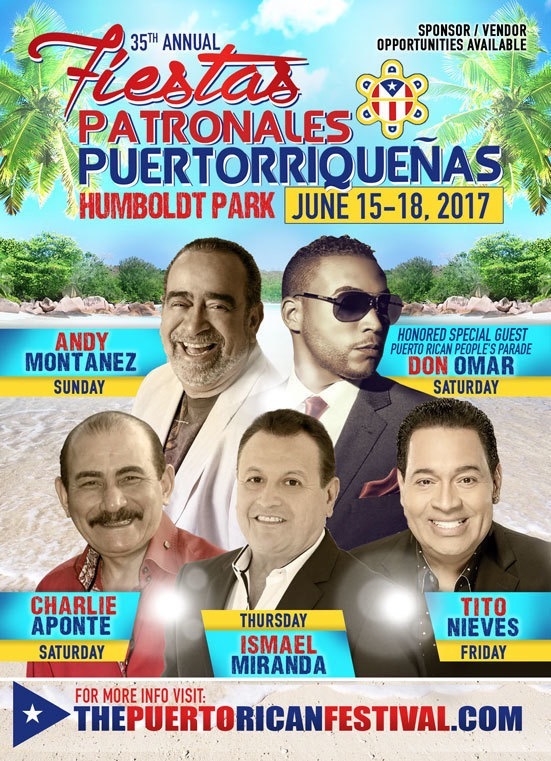 The 35th annual Fiestas Puertorriqueñas takes over Humboldt Park this weekend with carnival rides, delicious foods, with the parade kicking off on Saturday, June 17th on Division Street from Western Ave., to Sacramento Ave., beginning at 2p.m. Special appearance will be made by Miss World Stephanie Del Valle and the Chicago Cubs World Series Trophy. Musical acts include Ismael Miranda, Tito Nieves, Charlie Aponte, and Andy Montanez. Head over to the Pilsen Taco Fest for two days of amazing food, local art, kids activities, Mexican beers, aguas frescas, and so much more. Some of the musical lineup includes, Manuel Menoz Puente, Carlos Rodriguez, and Jesse Palencia. This fest is also a great way to celebrate your father! In honor of Father’s Day, Miller Lite will help consumers over the age of 21 celebrate their old man with a Taco and a sample of beer. Celebrate your Father on Sunday from 2pm to 6pm at the Miller Lite tent. The community is invited to join Chicago’s newest World Refugee Day tradition to celebrate the diversity of the city’s refugee and immigrant communities. The event is free of charge and will feature an indoor “street fair,” performance space, international coffee bar, and interactive classroom. The event will take place at the Grand Army of the Republic Hall and Claudia Cassidy Theater, Chicago Cultural Center beginning at 2p.m.